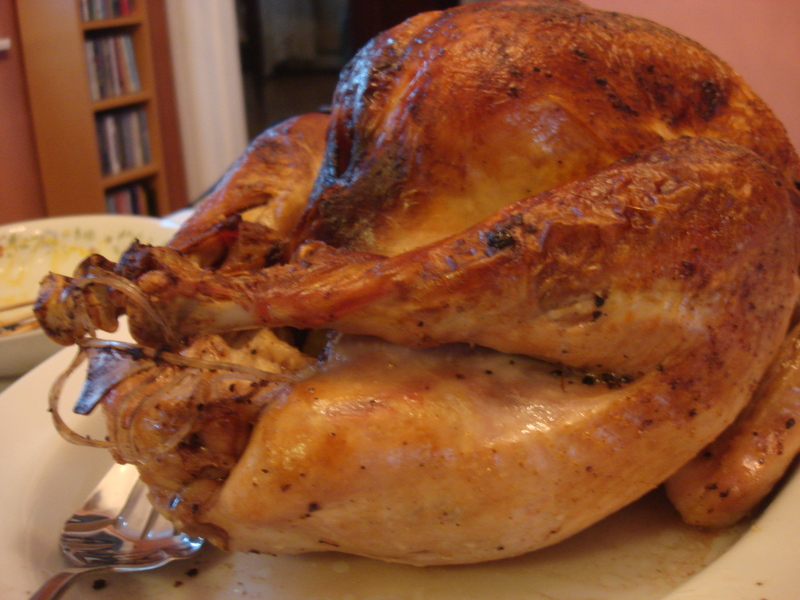 True confessions from Thanksgiving? I screwed up the gravy. Yes, I did. I forgot to leave out the liver when simmering the stock and suddenly, as everything was going ever so well, Leandro having helped me assemble the ingredients and snip the thyme from our little container outside and put everything together…I smelt it. We went from that fragrant poultry and herb simmering gorgeousness to a deep, ugly pungency that for someone with a liver aversion, someone like me, who feels ill with just a whiff of the awful offal, well, that smells like disaster. I dumped lock, stock and barrel, opened the windows and managed to salvage something resembling gravy from just the juices of the roast turkey (all available stock having been used up for other dishes), but it was so damn salty it could only be used drop by drop and I didn’t have time to thin it. Perhaps worse than the stock — and therefore gravy — failure on my part, my mom got to use the packet of powdered s**t that she bought just in case I should eff it up (to her credit, she didn’t gloat very much over saving the day). Those of you out there who are really from-scratch foodies will feel my pain, will understand that the handy envelope is evil like heroin, that it feels even worse than resorting to the drive-thru Happy Meal with the toy because you are just not a good enough parent to stand another minute of whinging child in the back seat….that it is — if not rock-bottom — somewhere pretty deep to go. 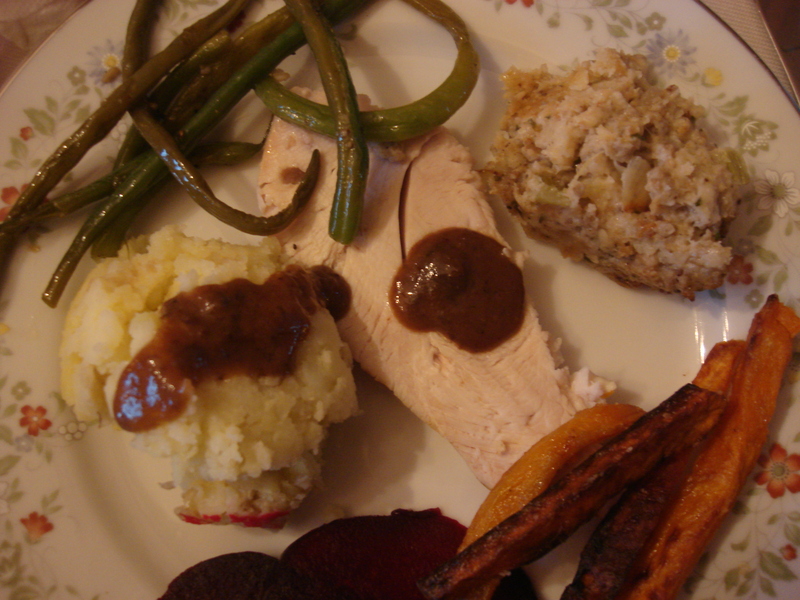 But, nevermind – everything else — the bird, the veg, the potatoes…the stuffing! — was delicious and joyous and I let it go…pretty much. I focused on the future, because not only does Thanksgiving return the next year so you get to try again (and make different mistakes), but also, alleluyah, the roasted carcass of that delicious bird offers possibilities for redemption. So here is my normally very successful stock recipe. You can make it when you’ve got the turkey neck and giblets (LEAVE THE LIVER OUT, PLEASE!!! – Do as I say, not as I do) while the turkey is roasting (or the night before without distractions, which is what I should have done) or use the carcass after (which is what I did, just fine!). Or both! Place all ingredients in a large pot with enough water to cover (2 quarts). Bring to a boil, scooping off foam. Reduce heat and simmer until water is reduced by at least half. (I usually leave it at least an hour). Strain through a sieve into a container that will let you scoop off fat when the stock cools and the fat rises to the top. Use to make gravy or store for another dish. Will keep several days in the fridge; three months in the freezer. Oh no! The turkey looks great though! Ah, yes – there’s always next year. Perhaps someday we’ll talk about the ruined Bundt cake that never made it to the farm pot luck! Looking forward to that story! Hope to get to see you over the winter!